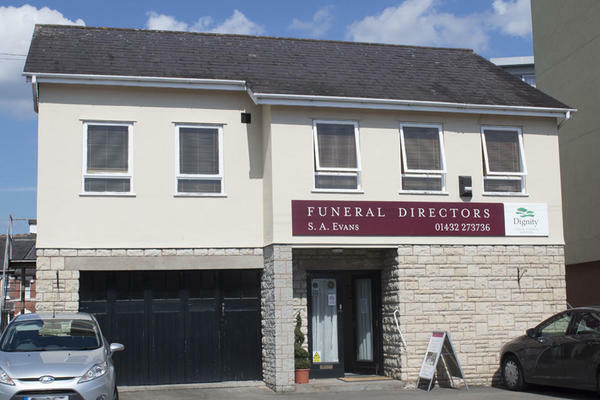 At S A Evans Funeral Directors in Hereford, our duty is to make this difficult time a little easier for you and your family. We are here to support and assist you every step of the way. We understand how important it is to get things right when it comes to saying goodbye, so we will listen to all your wishes, making sure the service is exactly how you want it to be. We will tailor every aspect of the funeral service, so it is personal and unique to you and your loved one. We have expertise in every type of funeral. Whether your preference is a religious or non religious ceremony, or a contemporary celebration of life, we will cater to all your needs. We have many years of experience and knowledge, so you can trust us to look after you and your loved one with an exceptional standard of care. You can find our funeral home on Gaol Street in Hereford city centre, just around the corner from Hereford County Hospital. Because of our central location, we also serve the families from the neighbouring communities of Eign Hill, Wide Marsh, White Cross, Burcott and Lower Bullingham. We are here as a shoulder to lean on, with our dedicated team on hand 24 hours a day. Call us as soon as you need us, so we can help you. Call us today on 01432 273736 to talk through your personal requirements. At S A Evans Funeral Directors, we understand how special life is with those that you love. For us, every funeral is unique and personal. We have a service to fulfil every wish, with every detail carried out with the same uncompromising quality of care. From a traditional service, to a colourful woodland burial, your options are limitless with our Full Service Funeral. If you have a little more flexibility when it comes to arrangements, then we can provide a Simple Funeral for a lower cost. Please see our map or get in touch if you need help with directions. Our staff are available 24 hours a day on 01432 273736 if you require our services outside of these hours. The staff were extremely helpful making suggestions when the family were uncertain. Every request was adhered to and the day of the funeral was extremely professional and the mourners were well looked after throughout the time. I could not have hoped for better! Thank you for taking the time to send your online review to us. I am pleased that we provided the highest level of care and guidance to you and your family and that all of the arrangements were carried out to your satisfaction. I would like to compliment Tracey and also Dale who master minded the perfect Funeral you would wish for. Thank you for your online review. I am pleased that the arrangements for your Father were carried out to your satisfaction and that you were so well looked after by our team. Excellent service. Tracy and her team were professional and efficient in all aspects of our arrangements. The Internment team were equally supportive and considerate to our needs. Thank you for sharing your experience with us on your online review. I am glad we were able to provide you with the support and guidance needed and that you were so well looked after by our team. The whole staff of S A Evans were very helpful and considerate during the days before the service. The service went very well due to the utmost professionalism of the team on the day. Thank you for posting your review online. I am pleased that we provided the highest level of care and guidance and that all of the arrangements were carried out to your satisfaction. Tracy at S A Evans was absolutely fantastic from start to finish. I felt that the service that she provided to us was very empathetic and that everything was covered professionally and with the utmost sincerity. Thank you for the kind comments posted on your online review. I am pleased that we provided the highest level of care and guidance to you and your family and that you were so well looked after by our team.